I am an Air Force Veteran, a Maintenance Scheduler for F-111’s. A C-5 quad due to an automobile accident in 1986. My husband Dale and I are proud parents of Ivy, our beautiful black lab. I enjoy NASCAR, hunting and music. Also, enjoy riding on our motorcycle with my husband. I have been with PVA since 1987. 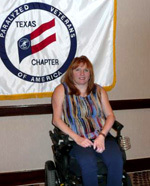 Advocating for our members and people with disabilities, both civilian and veterans is very important to me and look forward to doing more with the Texas Chapter.